New! Whether you're looking to complete your home theater with a custom built-in aesthetic, or simply wanting great sound spread throughout your home (even outdoors! ), HDX offers outstanding performance in a design that virtually disappears into your ceiling or wall. The HDX line is our follow-up to our award-winning HD speaker line. HDX improves on the HD performance while offering our customers the unique opportunity to determine the final aesthetic with two grille options. Need a single in-wall or in-ceiling speaker for use as a center channel or some other purpose? All of our in-ceiling and in-wall speakers are also available as EACH. 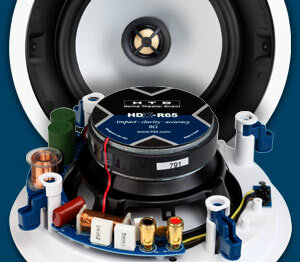 Don't settle for a generic speaker- we specialize in speaker design and it shows in every speaker we make. The swivel tweeters are recessed behind the grille so the speakers look perfectly flush, even though the most directional frequencies are aimed where you need them. A +/-3dB tweeter switch and a +/-3dB woofer switch give you complete control in fine-tuning the speakers to your room and personal taste. Non-ideal placement, such as in a corner, is no longer a problem. Our anodized aluminum dome tweeter produces crisp detail with none of the harshness or ringing associated with other metal dome tweeters. The larger the woofer, the more bass you will achieve. You also get more power handling. Both are important for large rooms. Our proprietary design allows for either of two styles of included grilles to be attached. Choose from a trimless grille attached via hidden magnets or a press-fit grille that exposes a modest trim, similar to canned lighting. The grilles (and trim if exposed) can be painted to match your decor, making the speakers virtually invisible. 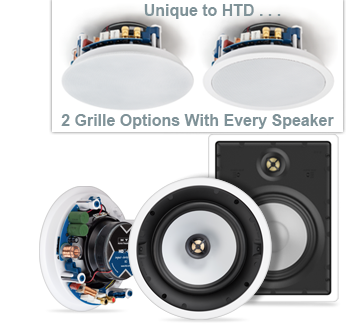 All of our HDX in-wall and in-ceiling speakers are well suited for use outdoors and in high moisture areas like bathrooms. Each speaker includes weather-resistant components, stainless steel hardware, and the smaller powder-coated aluminum grille will not rust.